Shigella is named after the Japanese microbiologist Kiyoshi Shiga who isolated the first member of the group in 1896 from epidemic dysentery in Japan which was then called Shigella shiga and is now called as S. dysenteriae. Non-lactose fermenting except S. sonnei. 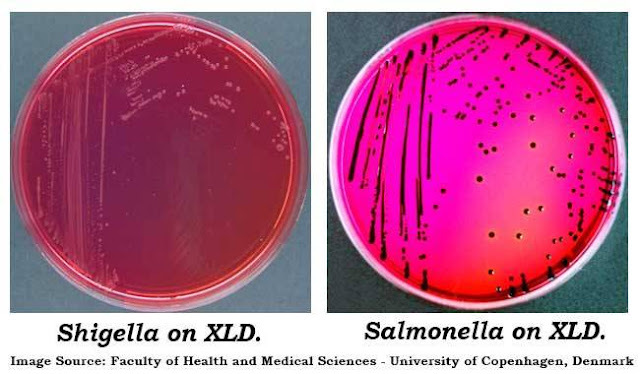 Deoxycholate citrate agar and xylose lysine deoxycholate agar is useful selective medium (Shigella do not have a black center in this medium as Salmonella). Shigella boydii: Less frequently isolated from dysentery patients. Classification: based on biochemical and antigenic characteristics. Subgroup B: S. flexneri: 8 serotypes. 2 mm in diameter, circular, convex, smooth and translucent. Death point (56°C for 1 hour), 1% phenol for 30 min, Viable in water for days and in ice for 1-6 months, In feces, it dies within few hour due to acidity produced by growth of coliform. Catalase positive except dysenteriae type 1. Shigella sonnei is a late lactose fermenter. Plasmid antigens: Effectors of plasmid transmit from the bacterial cytoplasm to epithelial cell cytoplasm of the colon. Invasiveness: Virulent Shigella penetrate the mucosa and epithelial cells of the colon in an uneven manner. Intracellular multiplication leads to invasion of adjacent cells, inflammation, and cell death. Cell death is probably due to cytotoxic properties of shiga toxin that interfere with protein synthesis. The cellular death and resulting phagocytosis response by the host account for the bloody discharge of mucus and pus and shallow ulcers characteristic of the disease. Other toxins: It has a Shiga toxin which may be neurotoxic, cytotoxic, and enterotoxin. The enterotoxin property is responsible for watery diarrhea. Two-stage disease: watery diarrhea changing to dysentery with frequent small stools with blood and mucus, tenesmus, cramps, fever. Culture media: Non-Selective Bromocresol purple lactose agar, Low selective MacConkey agar, High selective Deoxycholate citrate agar and SS agar. For More Notes on Microbiology Click Here.